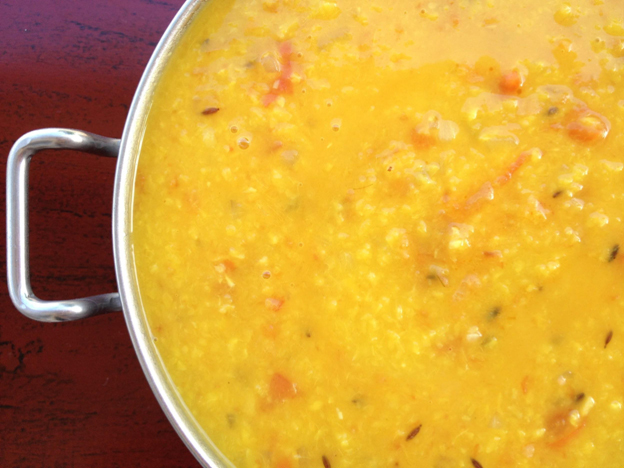 This dal is a staple in our house. It’s the first dal I fed my twins recently because of it’s wonderful smooth texture, and rich buttery flavor. It’s also easier to digest and causes less gas than other dals. If you are making this dal for a young child, you can omit the red chili and puree the dal in a food processor or blender after cooking. One of the great things about dal is you can leave it thick and scoop it up with some kind of Indian bread or over rice, or add more water and make it into a soup like consistency. Dal can be made ahead and refrigerated. It will thicken when cold, just add water to desired consistency when reheating. Enjoy! Rinse dal in colander until water runs clear, about a minute or so. Bring six cups of water to a boil in saucepan. Add the rinsed Moong dal, onions, tomatoes, garlic, ginger, turmeric, and salt. Cook uncovered over low heat for 60 minutes, stirring occasionally. Remove from heat. In a skillet heat butter, ghee or coconut oil, add red chili and cumin seeds; stir for 30 seconds and then add onions. Cook until onions are golden brown, stirring frequently. Stir onion mixture frequently, and cook until onions are a reddish brown and tomatoes are soft and the oil is separating from the tomatoes. Add onion mixture to dal, stir until combined and serve.